Holy Blessed Xenia of Petersburg. St. Xenia was the wife of Colonel Andrei Feodorovich Petrov, who served as a court chanter. At the age of 26, Xenia was widowed and, appeared to have lost her mind from grief: she distributed her possessions to the poor, dressed herself in the clothes of her reposed husband, and, as if having forgotten her own name, called herself by the name of her reposed husband - Andrei Feodorovich. These eccentricities were not indicative of a loss of reason, however, but signified a complete disdain for earthly goods and human opinion, which places them at the center of existence. Thus, Xenia of Petersburg took upon herself the difficult podvig of foolishness for Christ's sake. Some of Xenia's relatives wanted to take her in and provide her with all necessities, but the blessed one replied to them: "I do not need anything." She was glad of her poverty, and when visiting somewhere, would at times remark: "I am all here!" When her reposed husband's clothing wore out, Xenia clothed herself in the poorest clothing, and wore torn shoes without stockings on her feet. She did not dress warmly and forced her body to suffer from the severe cold. Sensing the greatness of Blessed Xenia's soul, the inhabitants of Petersburg loved her, because she despised the earthly for the sake of the Kingdom of Heaven. If Xenia entered anyone's home, this was considered a good sign. Mothers rejoiced if she kissed their children. Cab drivers would ask permission of the blessed one to drive her a little, since after this the earnings would be guaranteed for the whole day. Merchants in the bazaars would try to give here kalach [cracknel bread] or some food; if Blessed Xenia took something from what was offered, all the wares of the seller were quickly bought up. Xenia had the gift of clairvoyance. On the eve of the Nativity of Christ in 1762, she walked about Petersburg and said, "Bake blini! Tomorrow all Russia will bake blini!" The next day, the Empress Elizabeth Petrovna, suddenly died [blini is traditionally made at someone's death]. A few days before the murder of the royal youth, John VI (Antonovich, the great­great­grandson of Tsar Alexis Michailovich), who in infancy had been proclaimed the Russian Emperor, the blessed one wept and repeated, "Blood, blood, blood." Within a few days after Mirovich's unsuccessful conspiracy, the young John was killed. Once, Xenia came to a home where there was a grown-up daughter. Turning to the girl, she said, "Here you are drinking coffee, while your husband is burying his wife at Okhta." After a certain time, this girl married that very widower who at that moment had been burying his first wife at the Okhta Cemetery. A civil servant, Nicholas Selivanovich Golovin, had lived in Grodno approximately until 1907. He often experienced unpleasantness at work. He came to Petersburg to put his affairs in order, but they became even more entangled. Golovin was very poor, caring for his elderly mother and two sisters. In despair, he walked along the streets of Petersburg, and, though he was a man of faith, the thought to throw himself into the Neva stole into his soul. At this moment, some unknown woman stood in front of him. He was struck by her appearance, which was reminiscent of a poor nun. "Why are you so sad?" she asked. "Go to the Smolensk Cemetery, serve a panikhida [a requiem service] for Xenia, and everything will be settled." After these words, the unknown woman disappeared. Golovin fulfilled the advice of the mysterious nun, and his affairs were unexpectedly settled in the best manner possible. He joyfully returned home to Grodno. Emperor Alexander III, when he was the heir, became ill with a serious form of typhus. The Grand Duchess Maria Feodorovna was very alarmed by her spouse's illness. 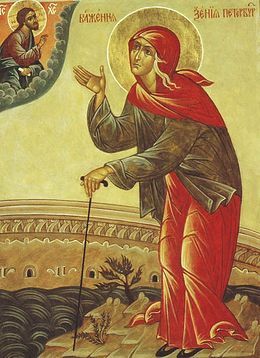 One of the valets, seeing her in the corridor, related to her how Blessed Xenia helps the sick, gave her sand from the cherished grave and added that he himself had been healed from illness by the prayer of the righteous one. The Grand Duchess placed the sand under the pillow of the patient. That same night, while sitting at the head of the bed, she had a vision of Blessed Xenia, who told her that the patient would recover and that a daughter would be born in their family. She should be called Xenia. The prediction of the blessed one was fulfilled exactly. A colonel's widow arrived in Petersburg to enroll her two sons into the Cadet Corps. She did not succeed in this. The money borrowed for the trip had come to an end, and the widow walked along the street and wept bitterly. Suddenly, some woman of the common people came up to her and said: "Serve a panikhida for Xenia. She helps in sorrows." "Who is this Xenia?" asked the colonel's widow. "The tongue [that asks the way] will lead to Kiev," she answered, quickly vanishing. Indeed, the colonel's widow easily learned who this Xenia was. She served a panikhida for her at her grave in the Smolensk Cemetery, and shortly after received the unexpected news that both her sons had been accepted into the Cadet Corps. A multitude of similar instances of Blessed Xenia's help is known also in our days. Dear Maria: You can order a Moleben (since Holy Blessed Xenia is a canonized saint we do not serve Pannikhidas at her chapel anymore), you can visit the following page: https://zapiski.elitsy.ru/church/sv-blzh-ksenii-peterburzhskaya-chasovnya-na-smolenskom-kladbische-v-spb. The second button down in the lefthand column is for a moleben (in gold. All the prayers for the living are indicated in gold, while prayers for the reposed are indicated in black). You can add names into the list on the page that comes up, then click on the last button at the bottom of the list. The recommended donation is 0, shown in rubles, so I don't know if a donation can be made in other currencies. St. Xenia is buried at the Smolensk cemetery in St Petersburg...not the city of Smolensk. I am Happy I found the Haghia Xenia in the internet. How can anyone make arrangements to visit her grave in Smolensk, I do not know... Maybe some day I will receive the massage from some one to help me arrange my trip from USA.. Thank you beloved St. Xenia for prayers answered! God has given you to us as a help in love and work. Throughout your earthly days, you had insight into the lives of those who knew you, and you directed them on the ways that they should go. You sent the young Golubeva to a cemetery in Okhta where she would find her husband, and many since have found the fulfillment of marriage by you. In your glorification, you have settled men in their careers, as you had put the affairs of Golvin in order when his work had driven him to desperation. I have found you as one who can help me as no one else could. So now, I ask you to point me too in the direction I must go to where I will find all I truly need. I prayed to St Xenia to meet someone special to marry. At 39 years of age, I met the love of my life 4 months ago and are engaged to be married in 6 weeks. God bless St Xenia!!! God bless St Ksenija! What a fantastic and beautiful story. Ksenija, please pray God for me and my family that I find the job that I am looking for. I'm truly thankful. Please st Xenia give me a good job and a good wife to married.God bless all the world and St Xenia. Heartwarming beautiful true life story of St.Xenia....honor and praise to God for Blessed God's holy servant St.Xenia for still helping, healing and directing one's life to the fullest! Anatoly, please do send your story to: editor@pravoslavie.ru and say that this is for the English edition. Looking forward to reading it. I would like to report a very recent miracle that is attributed to St Xenia. Could anyone please suggest the best way of doing that? Kindest Regards. Anatoli. I would like to know how I can have my name mentioned at her grave. I'd like to serve a Panakhida, but since I don't live in Russia, it is difficult to get in touch with a priest from Smolensk. Do you know any bank account of the priest from her grave or some contact info ? Thank you for your account of the Life of St. Xenia! Do you know of a way I can request a Panakhida be served at her grave for myself and my family? I have been out of work for a long time and it's creating great difficulty for our family. We are baptized Orthodox Christians, and are desperate for Her intercessions with Our Lord and Savior Jesus Christ! I'm praying to St Xenia for my husbands employment and marriage restoration and mental stability. In the name of Jesus Xenia help me. What an amazing woman! Thank you for posting this article.